Imagine living on the Florida Gulf Coast, the stunning beaches, the relaxed lifestyle and year-round sunshine, and you will understand why this destination is very desirable for visitors and full-time residents alike. Of course, by living at the beach, individuals choose to enjoy all the pleasures that Pensacola Beach has to offer year-round. Pensacola Beach is on a Gulf Coast barrier island in Escambia County. The island has access to the mainland Pensacola and Gulf Breeze via the Bob Sykes Bridge. The land belongs to the Federal Government by a 1947 deed which leases it to businesses and residents in renewable 99-year increments, making them long-term leaseholders through the Santa Rosa Island Authority, instead of property owners. Condos account for 67% of all real estate sales here. The five Portofino high-rise condo towers are the tallest buildings in Northwest Florida. 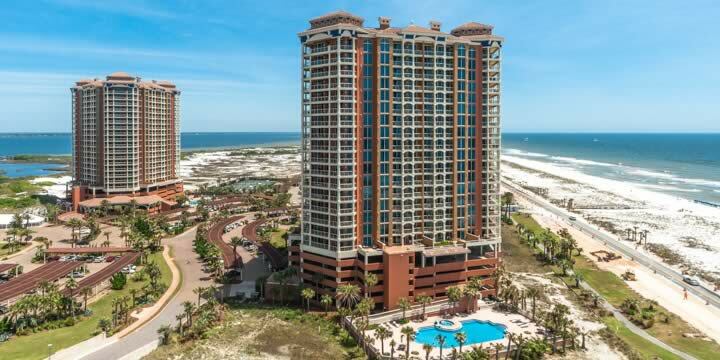 Prices of condos in Pensacola Beach, FL are between $200,000 to over $2,000,000 depending on size, location, and amenities. Vacation rental income is healthy and offers investment potential as well as having a vacation home to enjoy for the owner. Some condominiums on Pensacola Beach do not allow short-term rentals or have rental restrictions mandated by the Home Owners Association; this is essential information we share with our clients to help them make the right decision. Portofino - Five luxury towers with five pools and five spas, as well as a lifestyle center. Portofino offers the maximum amenity choices. Beach Club - Newer Gulf-front condominiums with indoor and outdoor pools, fitness center, and luxury spas. Verandas - Luxury residential condos with both sound and Gulf views. Designed with only two units per floor, allowing for private elevators. Short-term rentals are not allowed. Santa Rosa Towers - Popular hotel-condos with pool, fitness center, tennis courts, and clubhouse. Excellent rental income history. Emerald Isle - Emerald Isle is a long-time favorite for vacationers, close to the heart of the beach with restaurants, shops, and entertainment. The complex is "gated" and has all the best amenities. Emerald Dolphin - The Emerald Dolphin Condominium is a sound-front condo complex, with boat slips and deep-water access for owners who enjoy boating. Baywatch - Baywatch offers affordable two-bedroom condos on the sound, with a pool and private pier. Enjoy the luxury of a Pensacola condo starting under $200,000. Boardwalk - The Boardwalk condos are townhome-style two-bedroom units directly on the sound. Amenities include a beautiful pool, clubhouse, and bike/running path to the east end of the park. Sans Souci - Sans Souci has elegant Gulf-front condominiums directly across the street from Peg Leg Pete's, a favorite dining and nighttime entertainment center. Those who enjoy fishing can walk to the Pensacola Beach Pier. 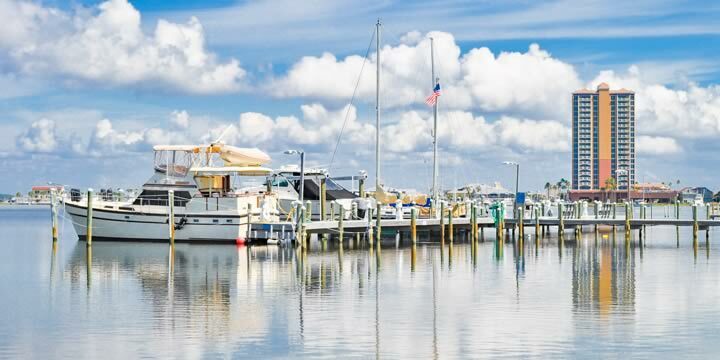 Sabine Yacht and Racquet Club - Sabine sits on the Little Sabine Bay and is perfect for boaters who love the marina, pier, and boat launch. The amenities do not stop there, however. A large pool joins the tennis facilities, sauna, and fitness club to equal the perfect resort. Palm Beach Club - The Palm Beach Club sits between the sound and the Gulf, offering fun on both. Also, the amenities include a pool and private beach access. This is a dog-friendly resort! South Harbour - South Harbour sits on Little Sabine Bay and offers views of the sound and Gulf as well. Amenities include a heated pool, hot tubs, boat docks, private beach, and a seasonal trolley to take owners and guests to the local attractions. Regency Towers - Regency is a pet-friendly and affordable Gulf-front condo resort with all the amenities, including a beachfront pool, double tennis courts, and the beach trolley to take you to the heart of Pensacola Beach entertainment. Tristan Towers - Another longtime favorite for vacationers, Tristan Towers, offers some of the most incredible views of the sound and the Gulf on either side and amenities that are second to none. A large pool, lighted tennis courts, a fishing pier, fitness facilities, and a gated entry for privacy. Pensacola Beach occupies nine miles of the Florida Gulf Coast at the western end of Santa Rosa Island. This is one of the most picturesque and visited beaches in Florida. Located at the west end of the beach is the historic Fort Pickens. This is part of the Gulf Islands National Seashore Park system. Vacationers find hotels, beach houses, restaurants, bars and recreation rentals to enjoy their stay. Relax in a beach chair with an umbrella that is available on the beach for a nominal fee. Buying a Condo on Pensacola Beach? Many investor and personal condo buyers understand the importance of knowing the market value of a condo before they make an offer to purchase. 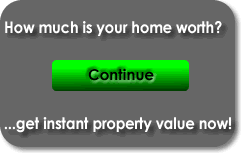 An effective way to do this is to use one of the Pensacola Beach real estate market reports to compare sales for a condominium. We have compiled real estate data in these reports, so buyers will know the price at which properties are currently selling. If you are interested in buying a condo on the beach, contact Emerald Coast Realty and an agent will promptly follow up with you to provide particulars on any property or arrange a viewing, 850-437-5618.